Folkmanis 2985 - Pretend you are in the mountains enjoying the peaceful scenery and fresh air. 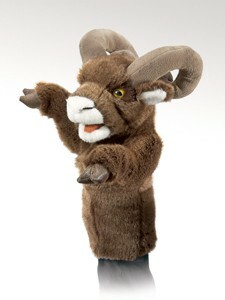 This BIGHORN SHEEP puppet can be your guide as an expert climber and a tough guy. He knows the ropes and no one wants to mess with those horns! Movable mouth and arms. Stage puppet measures 4” x 9” x 15”.